This work and power calculator helps you determine the mechanical power of a certain device. You can also use it to find out how much work will be performed by a machine of a given power in a certain amount of time. If you want to calculate electric power, try our Ohm's law calculator. In Physics, work performed by an object is understood as the amount of energy that needs to be supplied to move by a certain distance. For example, it can be the energy required to carry heavy bags up the stairs or kinetic energy resulting in the movement of the body. Generally, it is calculated as force multiplied by the displacement an object travels. Precisely speaking, it's a dot product between these two quantities. It is measured in joules (J), which are expressed as kg * m^2 / s^2 in SI units, or in kilowatt hours (kWh). Power is the rate of change of work or, in other words, amount of work done in a certain time. The higher the power of a device, the more work can it perform in a given time period. It is measured in watts (W), which are equivalent to kg * m^2 / s^3 in SI units. Determine the value of work. You can either directly type this value into our calculator or use the advanced mode to find it basing on force and displacement. In this example, we will assume W = 9000 J. Determine the time in which the work will be done. Here, we can take t = 60 s.
Power is equal to work divided by time. 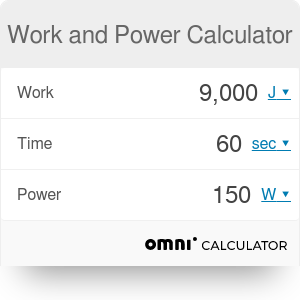 In this example, P = 9000 J /60 s = 150 W.
You can also use our power calculator to find work - simply insert the values of power and time. For some real-life applications of power, check out the cycling wattage calculator! Work and Power Calculator can be embedded on your website to enrich the content you wrote and make it easier for your visitors to understand your message.